Thoughts on Boo’s injury, new singlets, attendance, and more. OSU took out Iowa State 22-15 on Saturday, but it wasn’t without consequence. Boo Lewallen looks to be done for the season and the Cowboys took a few hits along the way. Here are a few thoughts on all of it. Hard to make a much more obvious statement, but seeing any kid go down like that is rough. Watching one that’s fought through injuries like that for most of his career and still had a lot of success is even tougher. As I was watching his match I was truly thinking this kid may be a national title contender. He was up comfortably against a tough opponent, and by all indications, has an edge in the room against a top 5 guy in Kaden Gfeller. Then boom! He goes down, and suddenly every thought I had on future lineups and how the team race shifts with him in them goes away. I’m not sure where he’ll go from here. It seems certain that he would get a medical redshirt if he applies for one, but is another surgery an option? Is this something where he can only heal to a certain point and hope to become what he was? It’s tough to know. John Smith said “he’ll be back” in the interview following the dual and I’m sure he will. During Lewallen’s absence, Kaden Gfeller lit guys up at 149 and wrestled very, very well there. 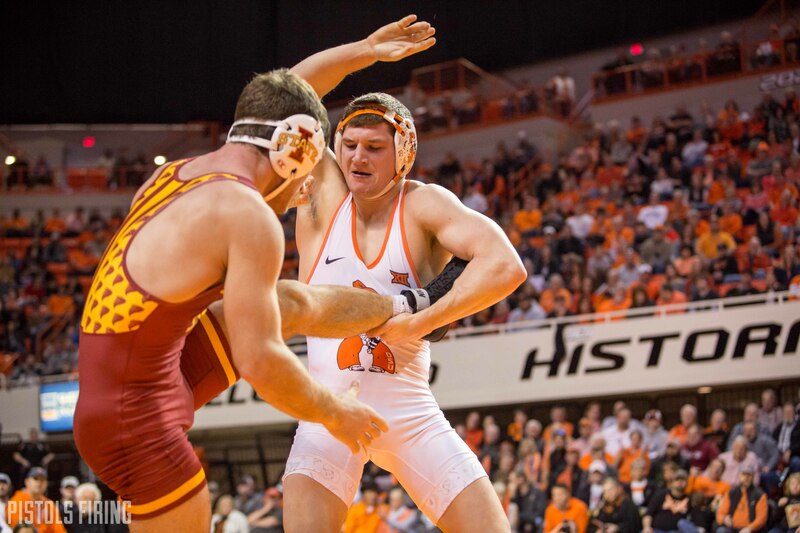 Naturally, he’ll probably slide right back in as the starter and All-American Kaid Brock will remain at 141. One positive is Chandler Rogers at least weighed in at 165, so the natural assumption is that he is close to his return at 165 and Andrew Shomers will likely move back down to 57 to contend with Jonce Blaylock and Wyatt Sheets for that spot. Shomers was the starter at 57 to begin the season and before the whirlwind of injury issues struck the Cowboys around these weight classes. 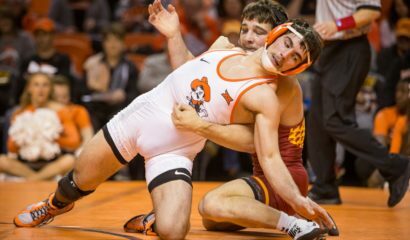 The crowd was great on Sunday, attendance of 4,915, which combined with the first two duals against Wyoming and OU has OSU averaging its second highest attendance in the last four years. At roughly 4,9888 attendees per dual they are around 50 people per dual off the pace of having the highest average attendance in the last 18 years. I’ve written a lot on it here, but I can’t begin to describe how significant that is in the wrestling “arms race.” You can legitimately make a difference in the success of this program by continuing to simply be a body in the stands. Also, the kids on the mat take notice of it. Nothing feels better for an athlete than a good crowd, thank you STILLY for your support. We are comin for 35! 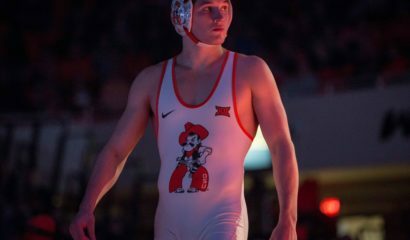 The kid has come in with some of the highest expectations of any recruit in OSU history. And he’s certainly living up to that mark, but to some extent I believe some, including myself in my writing here, may have built up a slightly unrealistic mystique regarding him. 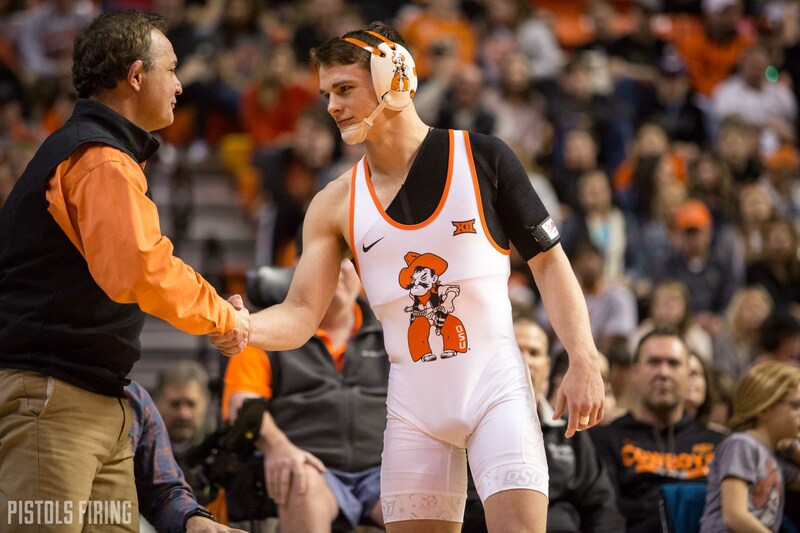 He is a great wrestler that will be a multiple time NCAA champion, and I have little to no doubt he will make Olympic/World teams and win medals. That doesn’t mean he won’t be pushed in his career and that he won’t be tested. Guys that are on his level lose matches and are pushed at times. The wrestlers opposite him will all have similar goals and will all be out there fighting to achieve these goals. Him scratching out tough wins against good opponents is something we’ll see, and it’s not a bad thing. There are teachable moments in those matches that he can learn from and ultimately it all builds to March. The all white with Pistol Pete centered on the front was definitely one of my favorite combinations this year. On social media and on here there are certainly critics that don’t like the new looks the Cowboys have been rolling out. I’m sorry, but I have to tell you on this topic your opinion does not matter. Recruits eat this type of stuff up and that is why OSU does it and will continue to do it. There will still be matches wrestled in the traditional all orange, as there should be, but these were great!